In this article, you will find how to use the search and replace tool: searching for a specific translations to be replaced by another one in all your translations list. Use case: the Search and Replace tool is useful if your company name, product brands or any other content have been mistranslated and you want to replace it everywhere. First, go to your Translation tools and select the tab "Search and Replace". Then write the translation you want to replace and the one you want to put instead. Click on "Replace". Automatically, you will see a green message telling you how many translations have been found and replaced in your translations list. 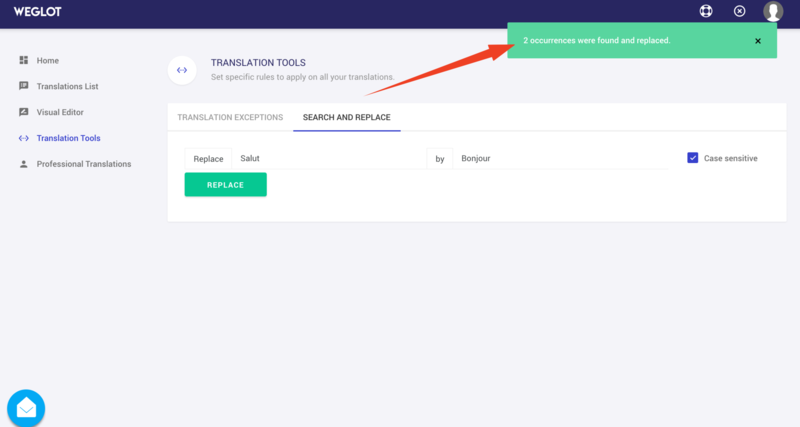 Please note that the Search and replace tool will only apply on your existing translations already in your translations list (and not on future translations added afterwards). By default, the search and replace is case sensitive (tick box checked on the right). If you uncheck the "Case sensitive" option, Weglot won't make the difference between uppercase and lowercase. CASE SENSITIVE ON: Weglot will search and replace only the word "Apple" by "Pear". CASE SENSITIVE OFF: Weglot will search and replace the word "Apple", "apple", "APPLE" or "aPpLe" etc. by "Pear".